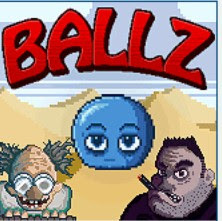 Ballz is another new platformer type adventure game from notdoppler. This game features a ball whose goal is to collect stars in each puzzling levels by rolling, bouncing, and transforming from light to a heavy steel ball. Avoid obstacles and try to collect all of the stars through all 25 challenging levels of this platform adventure game. The gameplay is good and levels are progressively challenging and also addicting. If you got stuck at some point of it, this Ballz walkthrough should get you through all of the levels.